As researchers, our aim is to understand the world a little bit better. Knowledge and understanding is the foundation for any development. For me, as an anthropologist in the field of global health, this means to understand structures of poverty, and the close relationship between poverty, vulnerability and health. My wish is to produce evidence that can contribute to poverty reduction and to reduce inequality and injustice, one small step at a time. One study area we have been involved in for many years at SINTEF Technology and Society’s Department of Health Research, is access to health care in resource poor contexts in southern Africa. It is a fact that for any development to take place, the population must have access to appropriate health care in order to survive and be healthy. It is a study on this topic which has taken me to Malawi this time (See GeoHealthAccess website for more information). 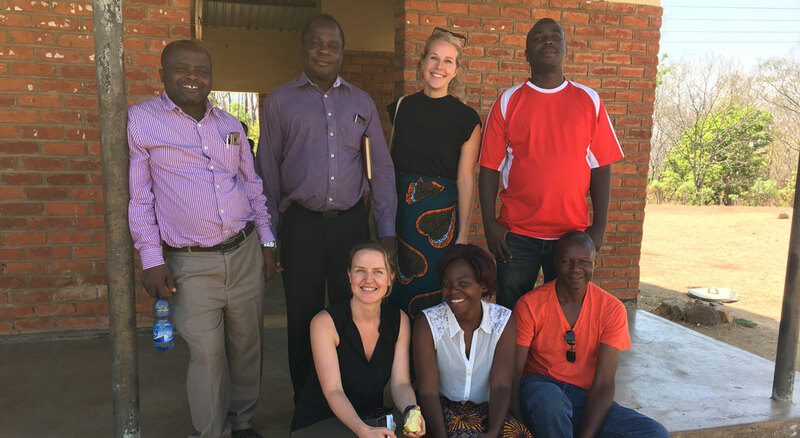 The fieldteam: (back row from left) Dr. Alister Munthali (University of Malawi), Dr. Peter Mvula (UoM), Esther Konijn (master student NTNU), Fiskani Msutu (research assistant), (front row) Dr. Stine Hellum Braathen (SINTEF), Leah Mziyah (research assistant) and Daniel (driver). Malawi, in southern central Africa, is one of the poorest countries in the world. The majority of the population live below the poverty line (less than $1.90 per day). This country is known as the ‘warm heart of Africa’, and it is not because the temperatures are so high (although they are at times), but because Malawians are extremely warm people. Having travelled and worked in many countries in Africa, there is a noticeable difference in Malawi; people are unusually welcoming, friendly, curious, generous and open, to me as a stranger and towards each other. Working in this context makes my extremely privileged Norwegian life painfully obvious to me. I am not new to Malawi. In fact, I have worked in Malawi on and off since 2004, and have spent more days, weeks and months here than I can count. Still, being here stirs something in me; a deep sense of injustice and a feeling of hopelessness in not knowing how I, as an individual, or we, as a society, can contribute to a more just world. Let me tell you about the realities of doing fieldwork in Malawi from my perspective, and how I am faced with this injustice on a daily basis. When I travel in Malawi I prefer to stay in guesthouses that are clean, have running water and electricity, are safe and have mosquito nets (without holes) over the bed (malaria is rife in Malawi). Not unreasonable preferences, I am sure most of my SINTEF colleagues and fellow Norwegians would agree. Generally, a room in such a place in Malawi cost between US$ 60 and 100 per night. Every day we travel to the ‘field’, the place which has been selected for fieldwork, which for an anthropologist means where we do qualitative interviews, focus group discussions, observations and so on. Focus group discussion in rural Malawi. The field is often far away from the commercial centres that offer suitable accommodation and have access to appropriate food for me and the rest of the fieldteam. So, we travel for an hour, or even two or three, to get to the area where we do fieldwork. This area is always among the poorest in the country, as our overarching research topic is poverty. In this area everybody lives below the poverty line. In each household there are many people cramped together in small houses with no electricity, no running water and no appropriate sewage facilities. Diseases such as dysentery and cholera are rife, due to unsafe drinking water. There are only a few borehole pumps in the community, and the result is that people fetch drinking water from dirty rivers or streams, and use the same water for bathing and as drinking water for livestock. Most households survive on limited subsistence farming, piecework and some hand-outs from the government (mainly food and nutrition supplements). They don’t know from one day to another how or if they will survive the next day, week, month or year. Our task is to look at barriers and facilitators for accessing health care for people in this community. We are told that they live about 15-20 kilometres away from the nearest health facility. They get there by foot, and the walk takes about three hours one way. There is no public transport or ambulance facilities in the area, the only option are motorcycle taxis, but these cost about $2 one way, which is completely out of reach to pay for more or less all the households in the community. The result is that many people wait until it is too late to seek health care, the walk there is simply too strenuous, especially for someone who is already sick. We are told that it is not uncommon for pregnant women to give birth along the road, because they cannot reach the facility on time. Despite this reality, Malawians express gratitude for what they get. They are grateful that there is a health facility, and that most of the time they get the care and medication that they need. They are grateful that the staff are friendly to them. In contrast, I come from the richest country in the world, with one of the very best health care systems. I have never been afraid that should I get sick I would not receive help. But in Norway there are news-stories almost daily of the flaws and imperfections of the Norwegian healthcare system. I sometimes feel embarrassed to join in on the complaints, knowing how privileged I am compared to so many other people in this unequal world that we live in. I have unlimited access to clean and safe water from several taps within my private household. I can buy all the food I want and more. I pay more money for one night’s accommodation in Malawi than an entire household in a rural community spend over several months. I have more money in my wallet and in my bank account than they can imagine. The inequity is so painfully evident. We know that there is hope for change and development. Over the past decades Malawi has received more development aid than most other low and middle-income countries. During this period, the country has experienced increased vaccination rates and decreased infant, child and maternal mortality rates. School enrolment is higher than ever. And yet, economic development is lagging behind, and the majority of the population still live below the poverty line with limited or no access to basic infrastructure. Malawi is a policy rich country, they have all the best intentions, and indeed our research has contributed to policy change over the years. But implementation on the ground is slow. In the 14 years, I have worked in Malawi there has been very little noticeable change in the poor rural communities. I wish I could end this blogpost on a more positive note, with an answer or a viable suggestion to the way forward for Malawi and for a more just world. I don’t have the answer, I don’t even have a suggestion. I just know that we cannot give up and we can never accept the injustice. So I guess that we continue our quest for knowledge and understanding, and hope that it will contribute to a better world even if it is just one small step at a time. «One small step at a time». Highly important, well written. Thank you for sharing. Thank you for your kind comment, Mia! Thank you for your comment, Richard! I agree with your thoughts on bikes; indeed people’s lives would be made easier with access to bikes. Several attempts have been made by NGOs over the years to provide individuals, communities and health services with bikes, or even motrocycles. The problem is that due to the condition of the roads, they break easily, and there is no access to spareparts, or even people who can fix the bikes. It is not uncommon to see broken bikes lying around unused in the comunity. Thus, giving out bikes without also putting in place an affordable system for spareparts and repairs is a short-term fix.